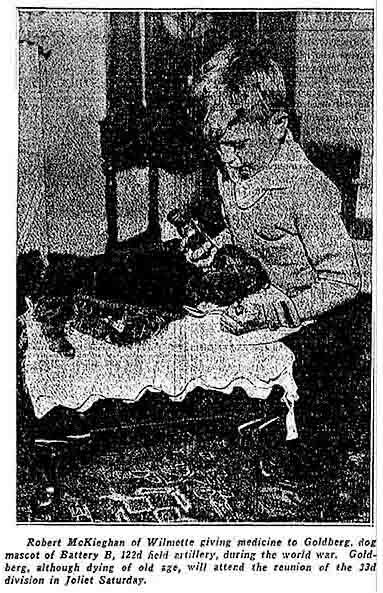 After hearing this story, I wondered what happened to the dog in the display case. 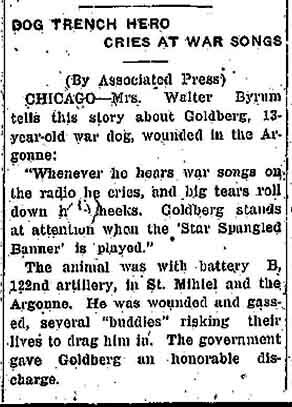 Some initial research revealed that the dog's name was Goldberg. Goldberg, who in 1918 accompanied the 122nd Field Artillery in France, currently stands with soldiers in a museum display depicting a WWI bunker. 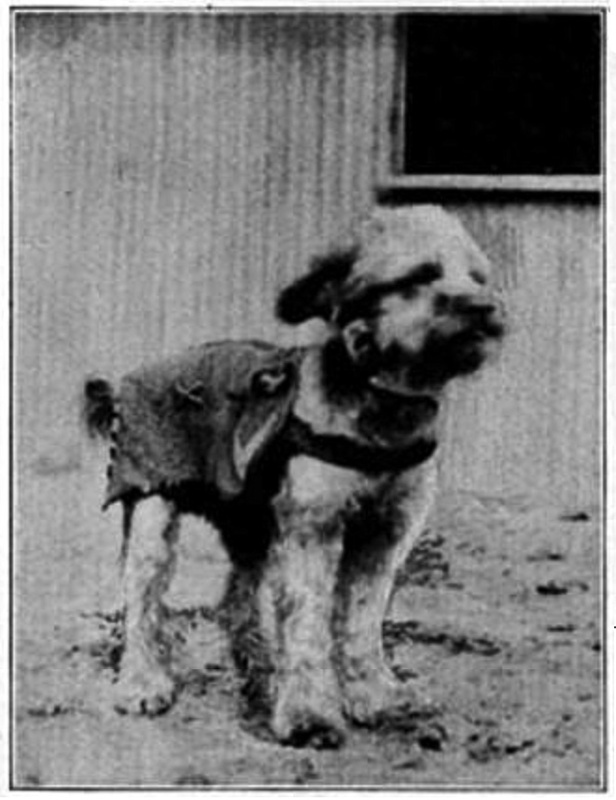 Goldberg circa 1918 wearing his service cape showing the crossed rifle insignia of the field artillery and the inverted chevron indicating war service. 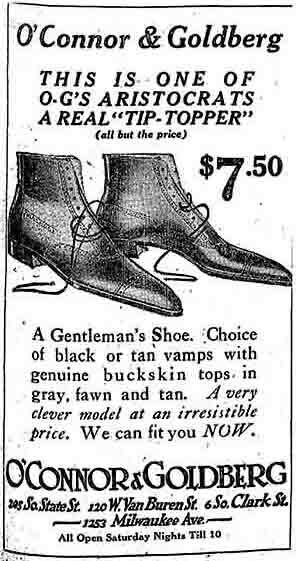 From the 1920 book, Illinois in the World War. 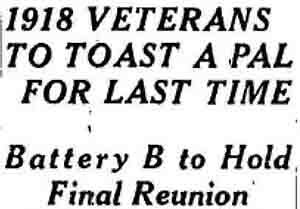 Battery B of the 122nd Field Artillery was deployed to France in May 1918 They returned to Chicago exactly one year later. (Continued from left.) 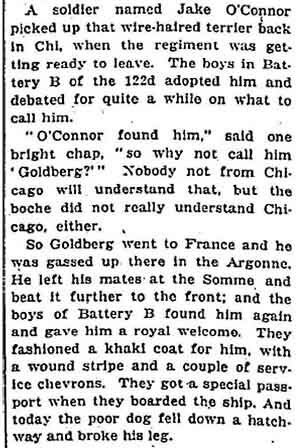 The writer of this article has padded Goldberg's war exploits by adding several more battles than initially reported in May. 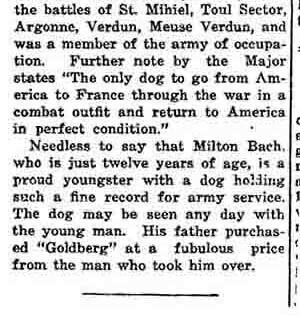 Within three months of his return from France, Joseph Bach purchased Goldberg at a "fabulous price" for his twelve year old son, Milton. 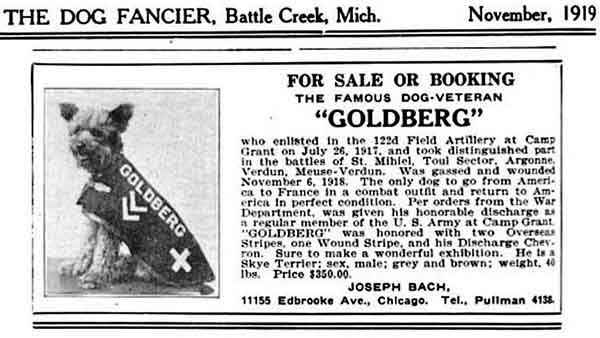 Milton Bach had Goldberg for four months when his father Joseph advertised the dog as available for either sale or booking as a war hero, billed as "The Famous Dog-Veteran." By this time, Goldberg's service cape has accumulated another service stripe along with a wound stripe and a discharge chevron. He is identified as a Skye Terrier. Ten years later, Goldberg is still in the Chicago area and has learned some new tricks. 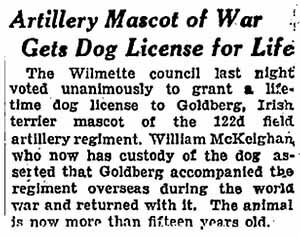 Honored at sixteen, Goldberg is now identified as an Irish terrier. 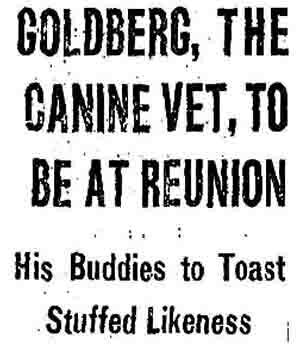 The picture, above, which appeared with the article at the right, shows the dying Goldberg as substantially smaller than his originally reported forty pounds. 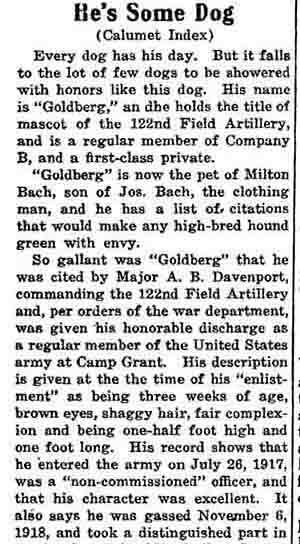 Also, unlike Joseph Bach's 1919 "Famous Dog-Veteran", according to the article, this Goldberg was taken by William McKleghan after the war.